Via sandara at Deviant Art. I have many friends who I've never met. Terry Pratchett was, I have to say, the greatest of them. He gave me company, comfort, joy, laughter tears and sadness tears and new ideas. He constantly questioned my old ideas, sometimes adding to them, sometimes gently correcting them or, at times, forcing me to realise that I'd been flat-out wrong. And all with a wry, twinkly-eyed humour which never berated nor belittled. 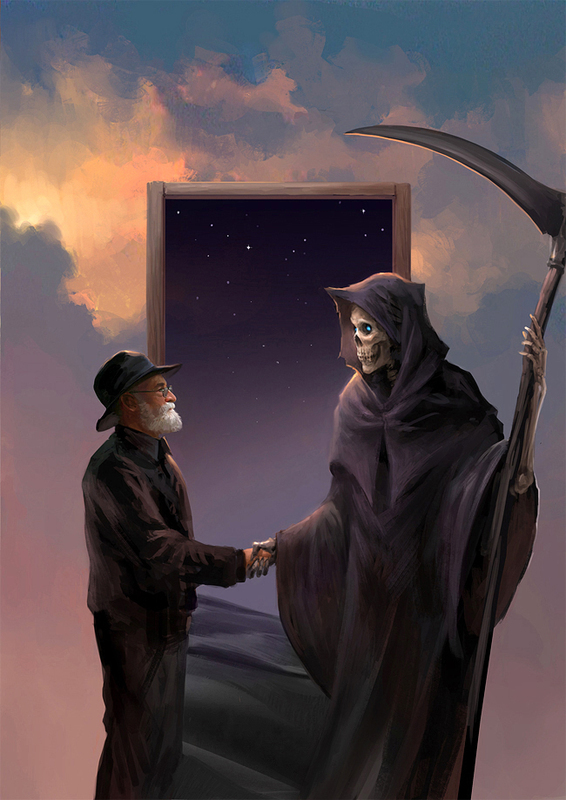 I am sad that my friend who I never met has met his own most sympathetic and memorable character, Death. I am glad that my friend is no longer suffering. I will miss my friend, though I never met him, terribly terribly much. Greebo had spent an irritating two minutes in that box. Technically, a cat locked in a box may be alive or it may be dead. You never know until you look. In fact, the mere act of opening the box will determine the state of the cat, although in this case there were three determinate states the cat could be in: these being Alive, Dead, and Bloody Furious. Shawn dived sideways as Greebo went off like a Claymore mine. "Don't worry about him," said Magrat dreamily, as the elf flailed at the maddened cat. "He's just a big softy."